Make sure to choose the right wood floors for your needs! If you own a business or have an active family, your wood floors are going to see a lot of traffic. Over time, lots of foot traffic can wear down your finish and can lead to extensive damage. Most wood floors will eventually get small scuffs and scratches, but those are easily fixed and don’t really damage the wood itself. Dents, gouges, and hard impacts, however, definitely will. If you know your wood floors are going to see a lot of activity, make sure you choose the most durable choice that fits your home or business. First, you will need to decide if you would like solid or engineered hardwood floors in your home or office. Engineered hardwood is fabricated by adhering multiple thin layers of wood together. It is then pressure-treated so that it’s hard enough to withstand the pressure of everyday use. Solid hardwood, on the other hand, is planks of solid wood that have been cut and sanded for use in flooring. Each type has its own benefits and drawbacks. The type you choose depends on how heavily the floors will be used, as well as your personal aesthetic preferences. 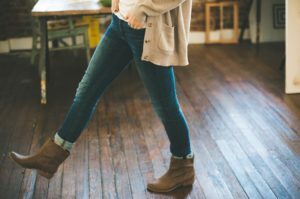 Since you know your wood floors are going to see a lot of wear and tear, you will want to choose something that’s pretty hard. On top of that, is the finish. You have two options for finishing: you can either choose planks that have been pre-finished by the manufacturer or you can have the professionals at Jason Brown Wood Floors apply the finish once the floor is installed. The finish should only be applied to wood floors by trained professionals. Talk to your installer to decide which finish is best for you. This entry was posted on Friday, May 18th, 2018 at 2:33 pm. Both comments and pings are currently closed.